The non-profit association Organic Exchange is reporting that sales of organic cotton have increased to $3.2 billion in 2008. This increase of 63% came about mostly thanks to increasingly vigilant buyers for large chain stores, such as for Wal-Mart, C&A, Nike, H&M and Zara. According to the association, the aforementioned companies form half of the top ten buyers along with; Anvil, Coop Switzerland, Pottery Barn, Greensource and the German business Hess Natur. 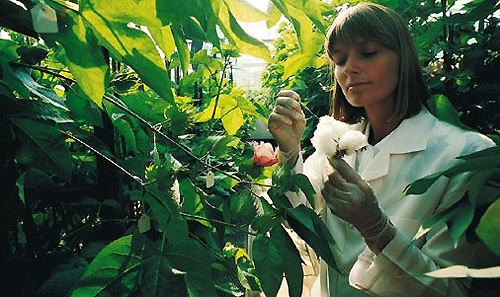 “It’s a good sign that despite financial predictions, brands and those involved are rapidly pushing their products towards more sustainable materials from start to finish, as seen with the ever increasing use of organic cotton and other organic fibres such as linen, wool and silk,” rhapsodized LaRhea Pepper, director of Organic Exchange. The Organic Exchange believes that the evolution of environmentally friendly materials has, owing to its increasing availability and marketability, led to production outstripping demand. “Farmers who planted speculatively or who grew and developed without business partners have without a doubt oversupplied the market for 2009,” explained Pepper. Last year, the number of organic cotton plantations grew by 152% while real production levels grew by 95%, as compared with only 53% in 2007 and 45% in 2006.